Going to be test-driving some vega vc-01/02 irons and vw-04 wedges, anyone with experience/feedback with these or any vega irons? i like their thinner top line, less offset and cool shapings/designs. 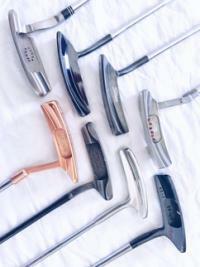 Any feel,looks comparisons to Miura, Bridgestone, Honma? I have 3 of their wedges in my bag. I like them very much. I forgot the grinds that I have. The raw finish is wonderful especially on sunny days. The feel is what you would expect. For me, I love the Shimada tour shafts that were used to shaft them. They are by far one of my favorite iron/wedge shafts that I have played. I never would have tried them if I had not taken a flier on these wedges. One day I might try out their irons. Thanks for feedback fsusp, the grinds are really interesting, traditional, versatile, lots of heel/toe and pm grind-like options. I also play with cobra driver and fairway and a xenon kutlas, good to see we are on same wavelength! I'm an independent clubmaker and have been working with VEGA for 4 years now. I'm also a golfer and I play the wedges (the new ALCOR wedge is very good on tight lies) and I've a mixed bag of VM-01 (PW to 7 iron) then VC-01 (6 to 4 iron) which I think is a great option. What is really amazing with VEGA heads is their weight distribution : they are exactly what is advertized on their website, +/- 1 gram, which makes it so much easier to build and have the perfect swingweight through the set : D2 at standard length and D4 for the PW. I may have to hit you up in a few weeks. I’m going to a club fitting and will perhaps send you my specs to see what you can do. Love Kyoei, had the Raf CM and VM02. In retrospect, should have never sold the raf cm. Best heads most people have never heard of, my raf cms were raw and literally arguably too soft. I will own Kyoei heads again, I will keep going back until I find a head set I love. I doubt you will be disappointed, good luck!